This blog provides the depth comparison between Exynos 7904 vs snapdragon 636. Exynos 7904 is produced by Samsung while Snapdragon 636 is manufactured by Qualcomm. Though Snapdragon 636 is an old chipset but it is very popular in mid-segment smartphone and still so many companies are adopting this chipset for their new budget segment models. On the other hand, Exynos 7904 is a new processor from Samsung which will probably make its debut from Samsung newly announced M-series budget segment smartphone. Both Exynos 7904 and Snapdragon 636 are fabricated on a 14nm technology. Qualcomm Snapdragon is a very old and trusted player in chipset manufacturing. Samsung in relatively new in chipset market but it has definitely solidified its position through its ARM based chipset of Exynos series. Since the announcement of Exynos 7904 and Samsung mid-range M series smartphone has come at the same time, we will definitely see a new Exynos 7904 based smartphone most possibly in Samsung M20. Since both Exynos 7904 and Snapdragon 636 are based on 14nm hence the comparison between the two is very interesting. At present, Qualcomm Snapdragon 636 is the first choice for mid-segment smartphones. The other chipsets from Qalcumm namely SD630 or SD632 are present in lower mid-ranger while SD670 or SD710 is offered in upper mid-rangers. So, if you put Exynos 7904 in the scene, it will come somewhere between Snapdragon 636 and Snapdragon 632. In one line conclusion, Snapdragon 636 has little advantage because it has 4 x Cortex A73 kryo cores, Adreno 509 GPU and support for UFS storage. Clearly, Snapdragon 636 has four performance cores while Exynos 7904 has only two performing cores. As far as GPU and CPU of Exynox 7904 go, It has octa-core chipset of 64 bit present in it that are arranged in eight core of two clusters. It has two Cortex A-73 cores for doing all high end tasks with 1.8 GHz clock speed while other 6 cores are of Cortex A-53 with clock speed 1.6 Ghz which are used to perform normal low end tasks. On the other hand, Snapdragon 636 contains 8 x Kryo 260 cores which are clocked up-to 1.8 GHz. Technically, Kryo 260 cores are actually Cortex A-73 based cores and four Cortex A-53 cores. Since, Snapdragon 636 has 4 high powered cores, it will outperform Exynos 7904 with only two Cortex A-73 cores. In the benchmark, this difference in performance will also reflect. In GPU and graphics, Exynos 7904 is using the new Mali-G71MP2 GPU while Snapdragon uses the trusted Adreno 509 GPU. Exynos 7904 process on 14nm architecture that supports up-to 32MP single sensor with triple camera set-up. The third-camera could be used for taking panoramas and ultra-wide shots. On the other hand, Snapdragon 636 could support up 24MP single lens or 16+16MP dual lens. Both chipset supports EIS features. In storage terms, Samsung Exynos 7904 supports LPDDR4X RAM and EMMC5.1 storage while Snapdragon 636 supports dual channel LPDDR4/4X RAM management up to 8GB. So both the chipset has similar features. In one-on-one comparison, Snapdragon 636 feels like a better chipset than Exynos 7904. The kryo 269 cores of Snapdragon 636 is better than Exynos custom clusters. 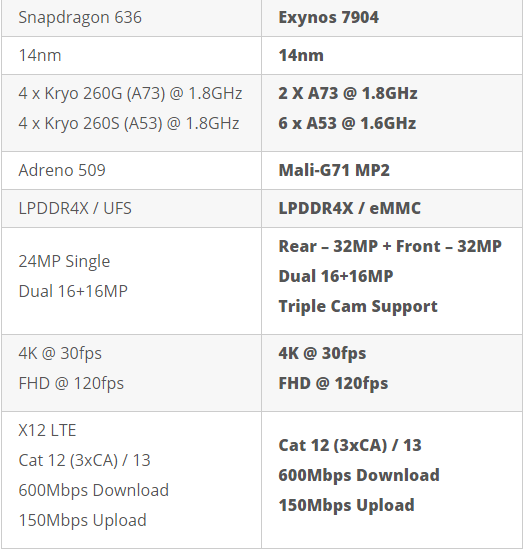 Performance wise, both are almost equivalent and you can pick devices containing any of these chipsets.